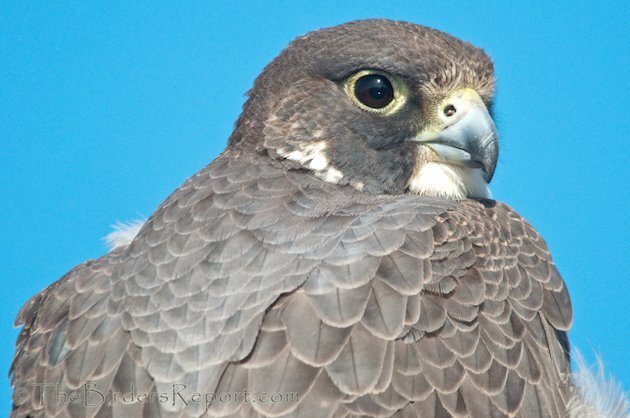 The name Peregrine means “wanderer,” and northern-nesting Peregrines are among North America’s long-distance migratory species, some moving 25,000 kilometers every year. 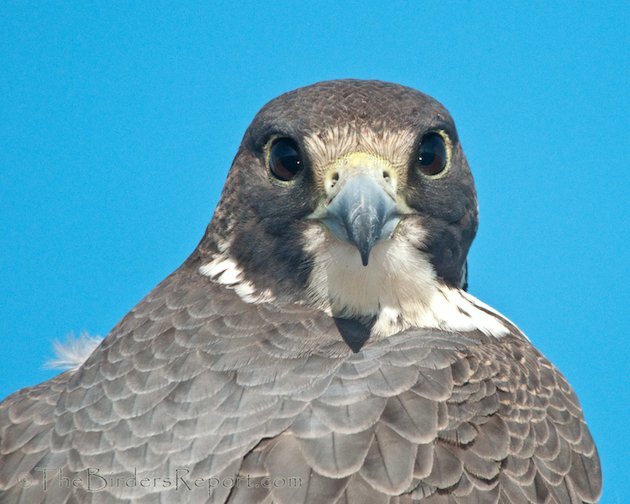 I’m sure most of you know that the Peregrine Falcon became an endangered species because of the use of organochlorine pesticides, especially DDT, during the 1950’s, 60’s, and 70’s. They were officially listed as Endangered in 1970 in the U.S. under the 1969 Endangered Species Conservation Act and later transferred to the 1973 Endangered Species Act; then protected with other birds of prey under the Migratory Bird Treaty Act through agreement with Mexico, but not Canada, in 19721. 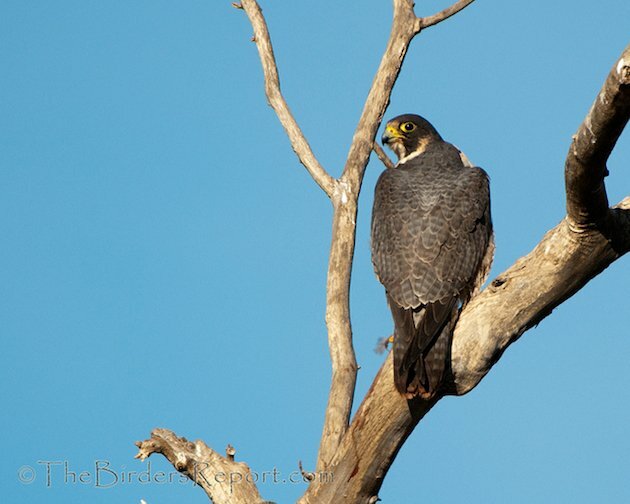 With the help of a captive breeding program, the Peregrine bounced back, and in 1999, they were removed from the Endangered Species List. 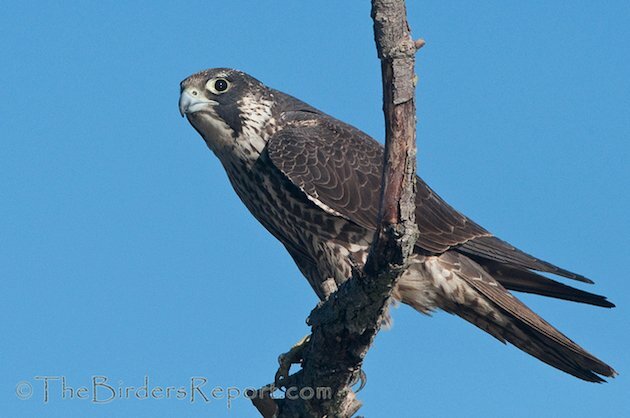 I have been fortunate to get a visit from this beautiful raptor in the photography blind at Delevan NWR. 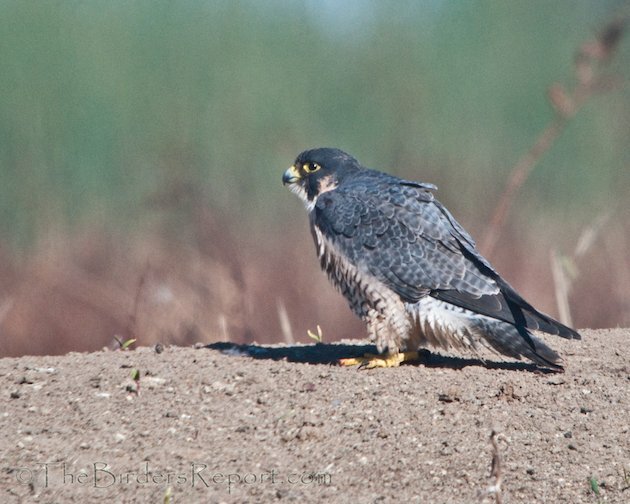 Flying in excess of 200 mph in a stoop, the Peregrine Falcon is considered to be the world’s fastest animal. 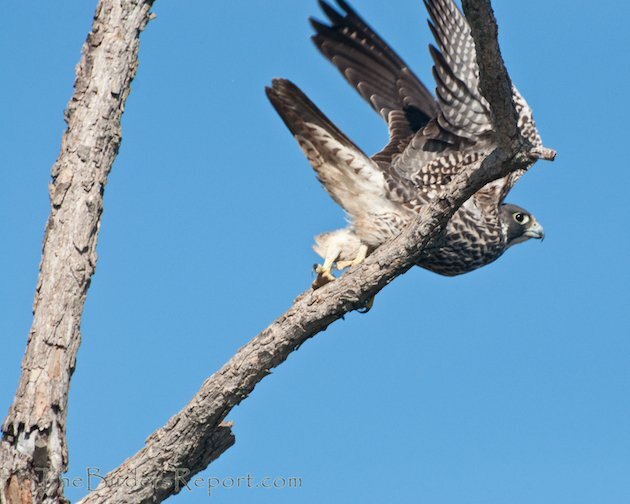 The air pressure from this high speed dive could possibly damage a bird’s lungs, but the small bony tubercles you see on this falcon’s nostrils guide the powerful airflow away from the nostrils, enabling the bird to breathe more easily while diving by reducing the change in air pressure2. 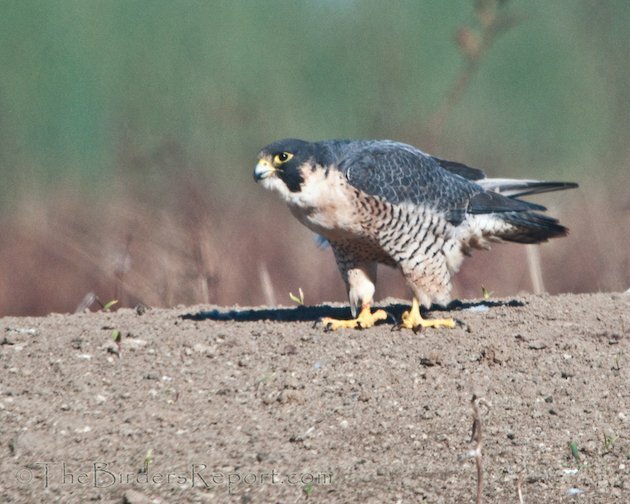 BBC Nature has a really cool video of the Peregrine hunting a pigeon in a stoop. Don’t miss it! 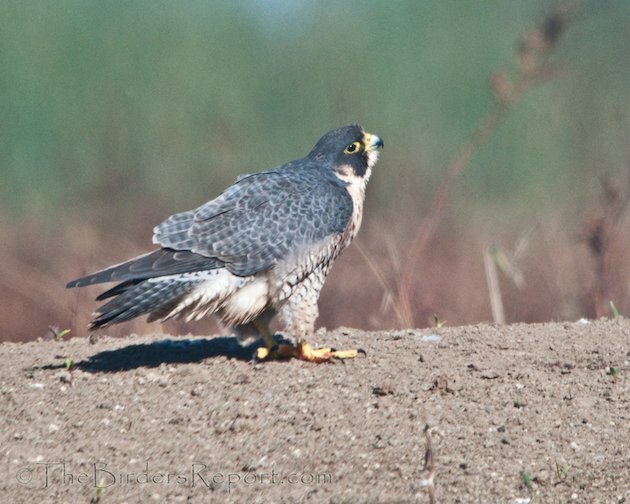 Peregrine Falcon from Sacramento NWR auto loop. Love those talons! 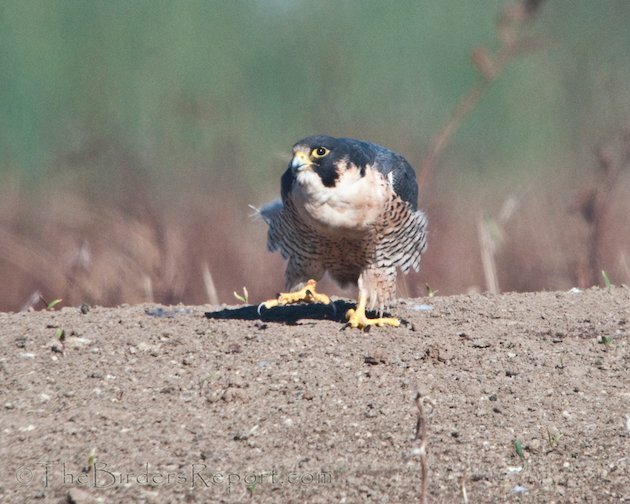 Although Peregrines are famous for hunting birds from above by stooping down on them, they use several other means of attaining prey and are most active at dawn and dusk. 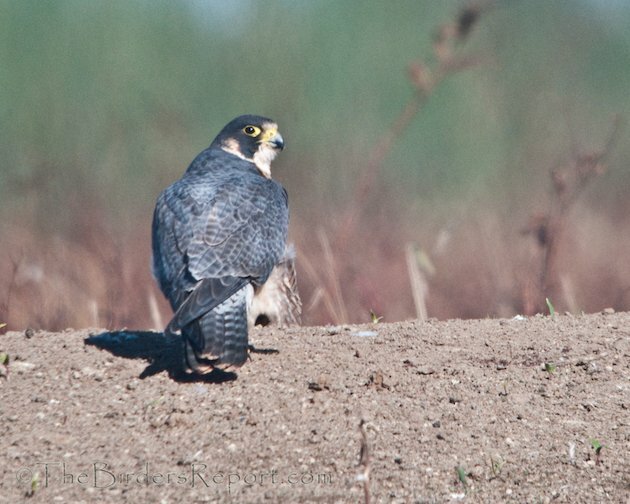 One of those is a special form of direct pursuit called “contour hugging” in which the falcon flies low, using concealing features of terrain or water to remain hidden from its quarry until very close. 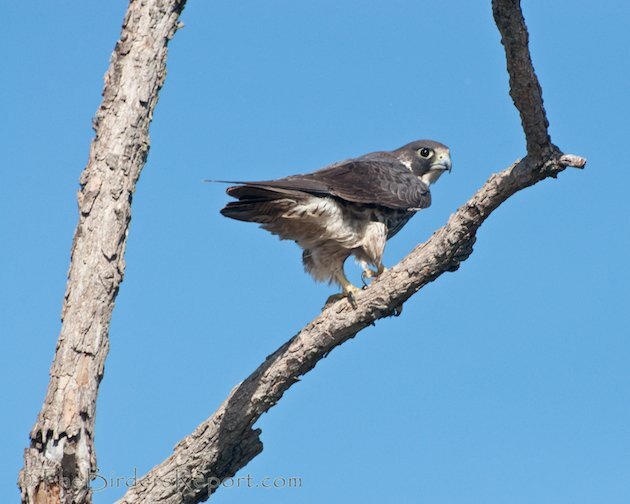 In such surprise attacks, birds sometimes fly up directly in front of the falcon and are caught before they can accelerate, while others freeze on the ground or refuse to fly from the water and are grabbed before they fly1. 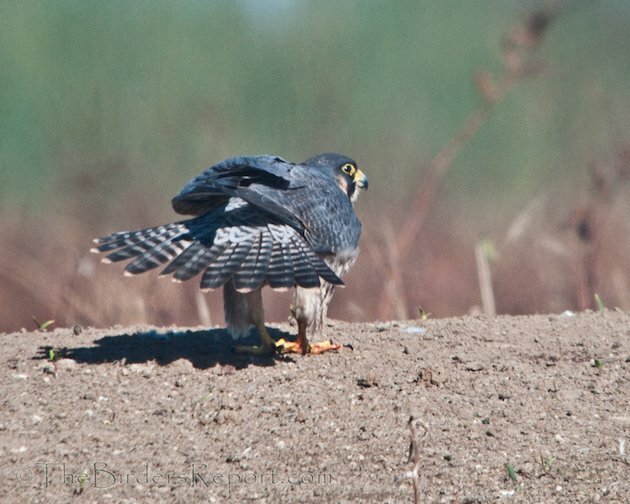 This may be the method this Peregrine had used before I spotted it from the Sacramento NWR auto loop. 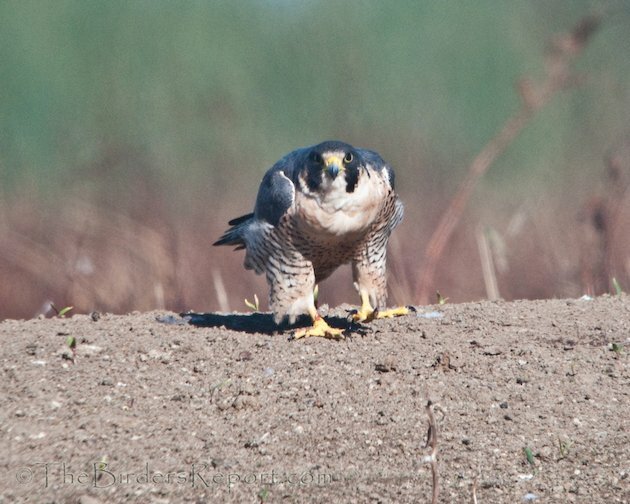 I think this falcon had just finished a meal and was just calmly watching the rest of the birds. 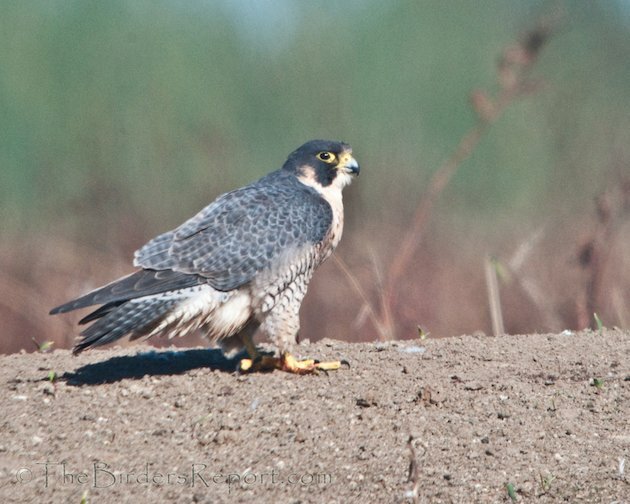 Just recently I spotted two Peregrine Falcons at Sacramento NWR while traveling the six mile auto loop. This one was right next to the road, a location where they can usually be spotted at this refuge. This last photograph is a juvenile bird as seen by the strong longitudinal dark, heart-shaped breast striping and blue cere and bare skin around the eye. 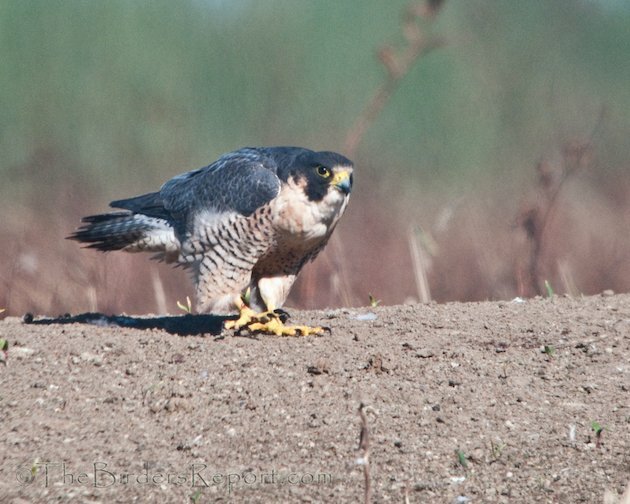 He dropped in for a visit three weeks ago when I was in Blind #4 at Delevan NWR. Obviously, our National Wildlife Refuge System is one of our most cherished environmental treasures. We not only want to keep them going, we want to expand them. Do you enjoy the National Wildlife Refuges in your area? National Wildlife Refuges have been underfunded since President Theodore Roosevelt created the first refuge in 1903 and Congress refused to appropriate money to manage it. Without adequate funding, habitats are not restored, invasive species are left unchecked, poaching and other illegal activities occur and our nation’s wildlife suffers3. America’s National Wildlife Refuge System is the world’s largest network of protected areas dedicated to wildlife conservation. For more than a century, the refuge system has been integral to bringing species such as the whooping crane back from the brink of extinction. Each year, tens of millions of people visit and enjoy national wildlife refuges in every U.S. state and territory, infusing nearly $1.74 billion into local economies and creating more than 32,500 U.S. jobs4. We are looking for bird enthusiasts, photographers, bloggers, biologists, hikers, conservationists, wildlife rehabilitators, scientists, teachers, artists and anyone else with a common passion and concern for our nation’s wildlife and wild habitats to join us in encouraging our legislators to create an alternative to the Duck Stamp for non-consumptive users of the wildlife refuges. If this sounds like a great idea to you, providing a consistent source of income for our refuges, separate but parallel to the current Federal Duck Stamp program, and you are involved in conservation or wildlife preservation, please send me an email with a short bio and a photo (at least 150 x 150 pixels) to place on our “About Us” page. We will keep you updated on our progress in this endeavor and entertain suggestions on the best way to implement our proposal. 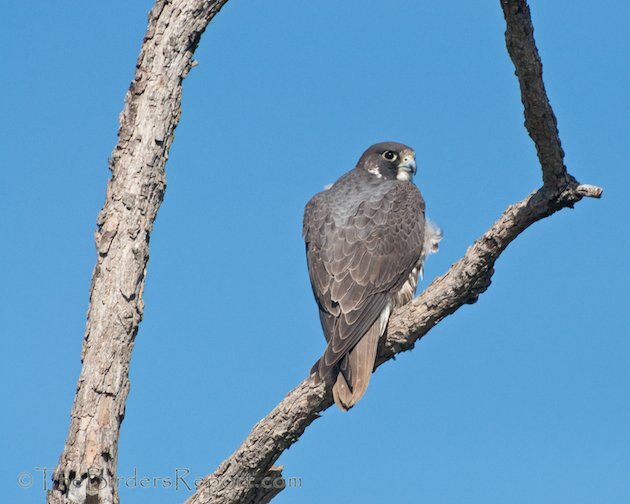 Larry, awesome shots of the Peregrine Falcons! Fantastic photos and a great idea for additional funding for our refuges. I’ll definitely spread the word. Wonderful stills and video of this gorgeous bird! Wonderful pictures – and this is one of the few birds that you post that I can see as well! Congratulations on these stunning photos! Thank you for these exquisite views of this bird!! I can’t wait to see one in the wild someday. Great close-up photos – the under-wing plumage pattern is especially beautiful. 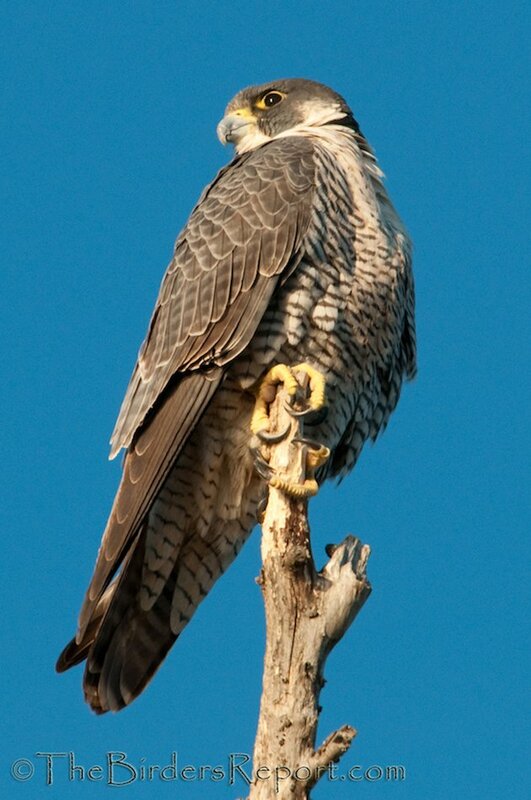 Larry, these images are simply breathtaking, the best “wild” shots of Peregrines that I have ever seen. The Wildlife Conservation Stamp web page content and illustrations are superb , and I wish you success in this project.